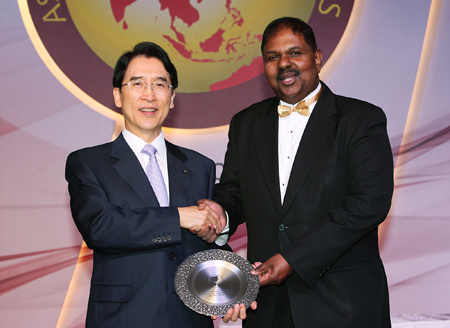 Kyobo Life Insurance Chairman Shin Chang-jae, left, poses with Sivam Subramaniam, editor-in-chief at Asia Insurance Review, after winning the Personality of the Year Sunday at the Asia Insurance Industry Awards 2012 in Kuala Lumpur, Malaysia, for his innovative leadership. Kyobo Life Insurance Chairman Shin Chang-jae was named Personality of the Year Sunday at the 16th Asia Insurance Industry Awards 2012 in Kuala Lumpur, Malaysia, for his innovative leadership and contribution to the insurance industry. He is the first Korean to win the award and it is another big achievement for the insurer following the Life Insurance Company of the Year award in 2009. Kyobo officials said Shin’s leading the firm to become one of the most trustworthy and financially-healthiest insurers in the world seemed to draw votes from the panel of 29 eminent insurance experts. It included Michael J Morrissey, president and CEO of the International Insurance Society; Dave J Matcham, chief executive of the International Underwriting Association; and Huang Tien-Mu, director-general of the Insurance Bureau at the Financial Supervisory Commission, Taiwan. Shin took over the reins of Kyobo Life in 2000 after the Asian currency crisis and introduced “Vision 2010,” a long-term corporate plan that shifted the company’s focus from volume to value and strongly pushed for quality driven management. The initiative turned out to be successful as the customer-driven and quality-oriented business culture with focus on stable profitability and risk management capability allowed the firm to survive the hard times and become one of the top insurers in Korea. Outside Korea, Shin plays an active role in international bodies like the Geneva Association (GA) and the International Insurance Society (IIS), where he is vice chairman of the FY2012 board of directors. He has also been sponsoring the highly-respected Shin Research Excellence Awards, a research partnership program between the IIS and the GA designed to foster original, practically-oriented applied research in insurance.